Over at The Register, Timothy Prickett Morgan writes that the German HLRN consortium is going to have a different brand name and architecture now that Cray has beat out SGI for a 2.6 petaflop supercomputer. During the first phase of system construction in the autumn of 2013, the initial XC30 system will go in with 1,488 dual-socket processor nodes sporting the next-generation “Ivy Bridge” Xeon E5 processors from Intel. The assumption is that the top-end Xeon E5 2600 v2 processors will sport ten cores compared to the “Sandy Bridge” v1 chips and their eight cores. So this machine should have a total of 29,760 cores in the initial stage, all linked together using the “Aries” dragonfly interconnect. 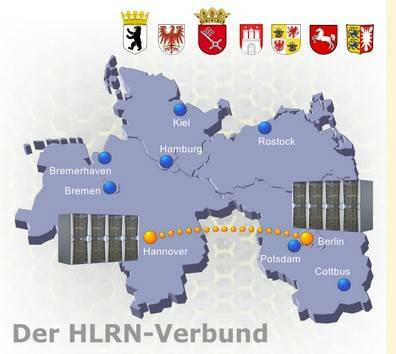 According to the specifications for the HLRN-III supercomputer, the Lustre-powered system will once again be split in two with one half in Berlin and one half in Hannover. Read the Full Story.